My daughter picked the colors--in case you were wondering. She loved making these. The best part is unfolding it when you're done to see what you've created. 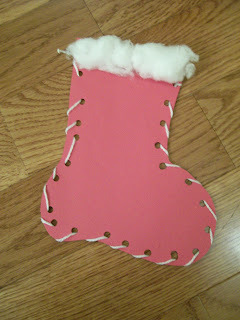 What's more fun than construction paper and glitter glue? We could have made these all day. My daughter colored in the bottle caps with marker and then glued them onto cardboard in the shape of a tree. The fun part is arranging the colors. A very simple project. Here's your classic laced stocking. My daughter recently discovered the hole punch and I thought we'd put all that punching to good use. 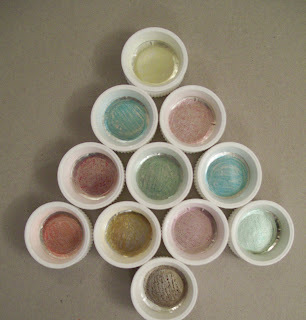 Love the bottle cap Christmas tree! 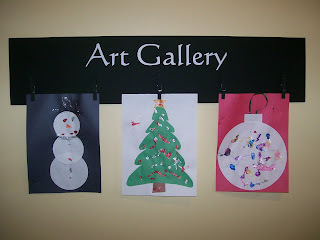 Oooh... your art gallery turned out super cute!! I need to make some snowflakes with the boys... William will love it! Looks like I'll be saving bottle caps....thanks for sharing, always looking for things to do with my little ones.